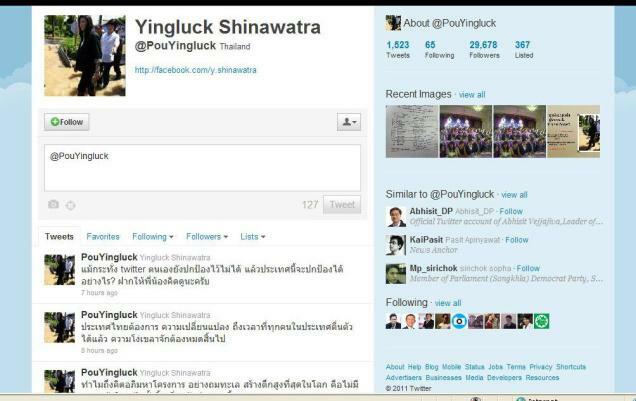 Prime Minister Yingluck Shinawatra's personal Twitter account was hacked on October 2nd, 2011 in what officials said was possibly part of a conspiracy to embarrass the government. Police in Thailand have arrested a university student who is said to have admitted hacking into the Prime Minister's Twitter account and posting messages accusing her of incompetence. 22-year-old Aekawit Thongdeeworakul, a fourth year architecture student at Chulalongkorn University, could face up to two years in prison if found guilty of illegally accessing computer systems without authorization.